Virginia Governor-elect Ralph Northam has named Matt Strickler—a 2007 graduate of the Thomas Jefferson Program in Public Policy at William & Mary and the Virginia Institute of Marine Science—as Virginia’s next Secretary of Natural Resources. The Natural Resources Secretary oversees six state agencies: the departments of Conservation and Recreation; Environmental Quality; Game and Inland Fisheries and Historic Resources; as well as the Virginia Marine Resources Commission and the Virginia Museum of Natural History. During his academic career at VIMS, Strickler combined field studies with water-quality and economic modeling to examine how land-use changes on Virginia’s Eastern Shore impact hard clam aquaculture, with a focus on clam-farming operations in Old Plantation Creek in Northampton County. 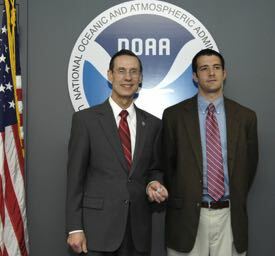 In 2007, he was chosen through the Virginia Sea Grant program as a Knauss Marine Policy Fellow within NOAA’s Office of International Affairs. This legislative experience presaged his later hiring as a staff member in the U.S. House of Representatives’ Committee on Natural Resources. Strickler credits both his Master’s research and Knauss Fellowship for his interest and rapid advance in the policymaking arena. "I'm honored and excited to be handling natural resources policy for Governor-elect Northam," he says. "The broad exposure I got at VIMS to a range of environmental science and policy issues, as well as hands-on experience working on Chesapeake Bay with scientists and stakeholders, has been invaluable to me and I know will serve me well in this new role." "I definitely wouldn't have been hired for my current position had I not served as a Knauss Fellow,” he adds. "It taught me an unbelievable amount about the interplay between science and policy." Strickler currently serves as Senior Policy Advisor to the House Natural Resources Committee under Democratic Ranking Member Raúl Grijalva (AZ-3) His portfolio includes fisheries, oceans, wildlife, and coastal policy, as well as related energy and public lands issues. He also handles matters related to The National Environmental Policy Act (NEPA). Prior to his work in Congress, Strickler served for three years as a Legislative Assistant to Northam during the Governor-elect’s stint as a Virginia Senator for the 6th District, which covers all or part of Accomack, Mathews, and Northampton counties, as well as the cities of Norfolk and Virginia Beach. He also worked on U.S. Senator Mark Warner’s successful 2008 campaign. Strickler will commence his new position as secretary of Natural Resources when Governor-elect Northam officially takes office on January 13 of next year.